Tibetans and Tibet support groups observed the forty-fifth Tibetan National Uprising Day on March 10th 2004, at Berkeley City Hall, San Francisco City Hall, the Chinese Consulate of the People's Republic of China in San Francisco, and at Union Square, in San Francisco's financial district. Bay Area Friends of Tibet (BAFoT), the Tibetan Association of Northern California (TANC), the San Francisco Tibetan Youth Congress (SFRTYC), Tibet Justice Center (TJC), the Committee of 100 for Tibet, (C100), and the Tibetan Nuns Project (TNP) sponsored the commemorations. Chimmy Gonpo, President of TANC, took the charge of the Berkeley program, and Giovanni Vassallo, President of BAFoT, took charge of the San Francisco events. The day's schedule started in Berkeley where Berkeley Mayor Tom Bates and Berkeley Councilmember Kriss Worthington participated in a Tibetan Flag raising ceremony attended by about 150 people, mostly Tibetans. Mayor Bates spoke after the Tibetan flag was hoisted to Tibetan tunes. We sang the Tibetan National Anthem, and the Dhen-Tsik Monlam prayer chant, and Chimmy Gonpo thanked the participants. Nearly 500 Tibetans and Tibet supporters then gathered in record-breaking heat at the San Francisco's City Hall main steps starting at 11am. His Holiness the Dalai Lama's March 10th Statement was read just prior to noon, which was the official starting time of the San Francisco program. Tsewang Chozom, a BAFoT board member, read the statement in Chinese in an effort to reach out to members of the Chinese-speaking public present. Chinese, Taiwanese, Tibetans, Burmese, Vietnamese, and other Americans filled the crowd. Monks of the Gyuto Tibetan Vajrayana Center of San Jose began by leading prayers, which were then followed by the Mimang Langlu song. We listened to a statement by San Francisco Board of Supervisors, President, Matt Gonzalez, read by Giovanni Vassallo. In the statement, Gonzalez wrote that he hopes "that our local Chinese community will take time to meet Bay Area Tibetans and supporters to exchange frank and friendly views for the benefit of understanding one another and moving the Tibet-China dialogue forward." The signed statement also called upon the China not to use the war on terror as an excuse to repress its own cultural, religious, or ethnic minorities. 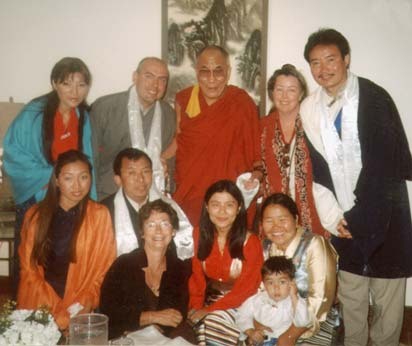 Additionally, he urged China to revisit the case of Tenzin Delek Rinpoche in "an open and just trial." Chris Daly, also a member of San Francisco Board of Supervisors, also spoke and encouraged similar themes. We then listened to US Congresswoman Nancy Pelosi's statement read by Dan Bernal, her Deputy District Director. Mr. Bernal repeated Pelosi's statement, which included, "Tibetans are routinely imprisoned and tortured for non-violently expressing their views. Beatings, prolonged exposure to extreme heat and cold, electroshock, sleep and food deprivation, and forced labor are among the techniques used to torture Tibetan prisoners" Pelosi wrote, "His Holiness the Dalai Lama is the key to peace and stability in Tibet. Envoys of the Dalai Lama have traveled to China and Tibet twice in the past year to continue discussions with Chinese authorities for a permanent negotiated settlement. It is time for the Chinese government to re-assess its hard-line stance toward Tibet and take a step forward into a modern, open and free society." She also wrote, "The survival of the Tibetan identity is an issue of urgent U.S. and international concern. If we are not committed to meeting the challenge of Tibet, we cannot be consistent when we talk about human rights in any other place in the world. The crowd applauded after Mr. Bernal read her concluding remarks, "As we honor the brave and heroic Tibetan people, we must heed the guidance of His Holiness the Dalai Lama. He is a constant reminder that the crisis in Tibet is a challenge to the conscience of the world. Please be assured I will continue to support the aspirations of the Tibetan people to preserve their heritage and regain their freedom." Former BAFoT President Diane Hume then read a statement by S.T. Day, Chairman of the Tibet-Taiwan Exchange Foundation associated with the Taiwanese government. Chairman Day wrote that the "Taiwanese people understand most their determination for defending their country, and will continue to support Tibetans' struggle for human rights and freedoms." Author Peter Gold spoke about the need to cherish and protect the Tibetan identity. Then Xiao Qiang, former Executive Director of Human Rights in China spoke. "I can tell you are really reaching out to your Chinese brothers and sisters," he remarked, noting that many of the protest signs in the crowd were also written the Chinese language. Former Chairman of the Kashag, the Cabinet of His Holiness Dalai Lama's Tibetan government-in-exile, Tenzin Tethong spoke in both Tibetan and English. Chimmy Gonpo spoke about the sadness he felt about the extreme poverty in Tibet he had witnessed in his recent trip to Tibet. The last speaker, Topden Tsering of RTYC then spoke. By that time, large parts of the crowd formation had managed to conform to the shaded areas on each side of the steps. Chants such as "Free Tibet," "Free Tenzin Delek Rinpoche," "Free the Panchen Lama," "Hear Tibet," "Self-Determination for Tibet," Human Rights in China and Tibet" roared through the crowd as this segment concluded. The group procession headed toward the Chinese Consulate at Laguna and Geary Streets at about 1:15 p.m. We arrived at the Chinese Consulate at about 2:00 pm singing, praying, and demonstrating. Many Tibetans and supporters shouted, "Free Tibet," "Shame on China," and different slogans. Again, Tsewang Chozom read His Holiness's March 10 Statement in Chinese. Rocky Liu, community organizer for Taiwanese-Americans then spoke. He called upon the Chinese government to respect fundamental Tibetan and Taiwanese human rights. We listened to special guest speakers, Heidi Basch and Margery Farrar, Special Human Rights Representatives of US Congressman Tom Lantos's office. In her speech, Ms. Farrar noted that there were areas that both Tibetans and Chinese could cooperate. She repeatedly praised Tashi Tsering, a Tibetan who works as an environmental specialist at the Berkeley-based Tibet Justice Center. She highly commended his efforts in working to resolve environmental issues of mutual concern to both Tibetans and the Chinese people. She encouraged the gathering to read Tsering's report and, "to take it home, and to make school books with it." She noted that very likely there were Chinese consular officials inside the consulate who cared very deeply about Tibet's environment. She also called upon the Tibetan and Tibet support group communities to protest more often at the Chinese consulate. "There were eight hundred people gathered at the Losar," she noted. There should have been at least that many of us here today. 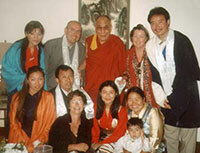 She encouraged us that we could act to change the situations in Tibet and China. Minnie Cancellero, Executive Director of Tibet Justice Center, then spoke, followed by a speech by Mr. Vassallo. The crowd then dispersed with many still planning to attend further commemoration events which was planned to include another demonstration at Union Square, a candlelight vigil and march from there, and to end with a final demonstration at Portsmouth Square, in the heart of Chinatown. Later that evening, around three hundred fifty people including Tibetans, Burmese, and Westerners gathered at Union Square, located in San Francisco's financial district. The Gyuto monks again began the demonstration with prayers. Tibetan opera singer Nyima Gyalpo led the Mimang Langlu song. Mr. Vassallo repeated Supervisor Gonzalez's and Chairman Day's statements. Then, Victor Win, Vice-President of the Burmese American Democratic Alliance (BADA) spoke about working together to advance Tibetan and Burmese democracy and human rights. Pema Chhinjor, who lost his brother and other family members during the 1959 uprising, and is the former Security Minister of His Holiness the Dalai Lama's government-in-exile, also spoke. Mr. Gonpo then addressed the crowd in Tibetan and again the last speaker was the RTYC leader, Topden Tsering. Mr. Vassallo then informed the gathering that the planned march through Chinatown and the demonstration at Portsmouth square had been canceled due to last minute objections raised by some senior members of the Bay Area Tibetan community led by the TANC president. They ranged from concerns about unduly annoying San Francisco's Chinatown residents to concerns about any possible confrontation between Chinese and Tibetan youth. Despite repeated assurances to the contrary by Mr. Vassallo, the chief organizer, and an additional assurance from a San Francisco police sergeant in charge of the pending march's security, that any confrontation was of the slimmest possibility, the journey to Chinatown had evidently proved too much to ask on this emotional anniversary commemoration of Tibet's worst tragedy. A candlelight vigil followed for Tibet's fallen heroes. The square was light up by numerous candles as the Gyuto monks again prayed and performed multi-phonic Buddhist chants. The sound of the monks chanting "OM MANI PADME HUM" the mantra of Tibet's patron bodhisattva, Chenresig, repeatedly filled the square as we wept and prayed for Tibetans and world peace. Nyima Gyalpo led us in the Dhen-Tsik Monlam prayer and the Tibetan National Anthem. Slogans calling for Tibet's freedom were again chanted. After thanking the many volunteers of the day's events and announcing the conclusion, Mr. Vassallo reminded the gathering that, "the dream and a hope of Free Tibet remains with you." The crowd gradually dispersed. That night, there was an extensive segment about Tibet and Uprising Day on KTSF, the local Chinese news station, viewed regularly by millions in the San Francisco Bay Area. It gave extensive coverage of the demonstration, showed clips of the movie "Tibet: Cry of the Snow Lion," and gave much footage of His Holiness the Dalai Lama. It also included interviews with our San Francisco speakers, Topden Tsering, Xiao Qiang, and Rocky Liu, thus directly addressed China's three "terrible T's:" Tibet, Tiananmen, and Taiwan.